I found myself purchasing another pre-mixed drink in the form of Jack Daniels and they’ve released two versions – Coke and Ginger, both £2.12 from Sainsburys. Now the nearest competitor around is Jim Beam & Coke and having already tried the latter I was expecting high hopes, however, I was disappointed at not smelling a stronger smell of the Jack Daniels (at 6% you expect to sense something). It was there don’t get me wrong, but compared to the Jim Beam, you had to hunt for it. Now that aside, the drink itself isn’t too bad. A low-carbonated cola is used so you can drink it quickly, but it won’t make you too bloated, and you do get that refreshing taste afterwards. The down side? 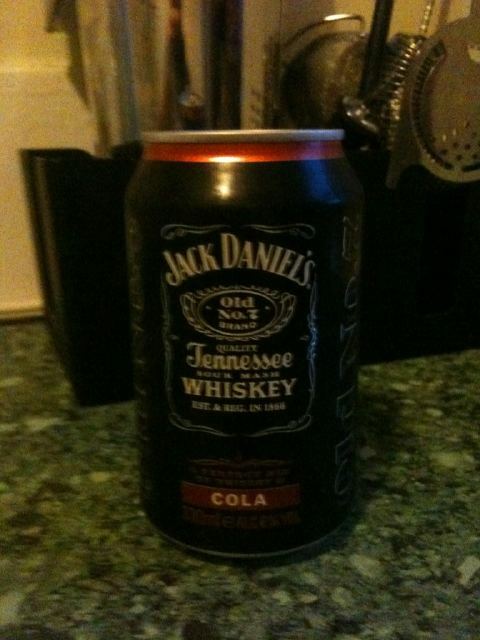 You feel like your not drinking a JD & Coke. It’s not got that freshness about it like the Jim Beam did, and it sometimes put me off finishing the can. But finish it i did, which can I only be a plus as im sure, like most of you, you wouldn’t finish something if you didn’t like it. I followed the Jack Daniels & Coke with its other variety – ginger. 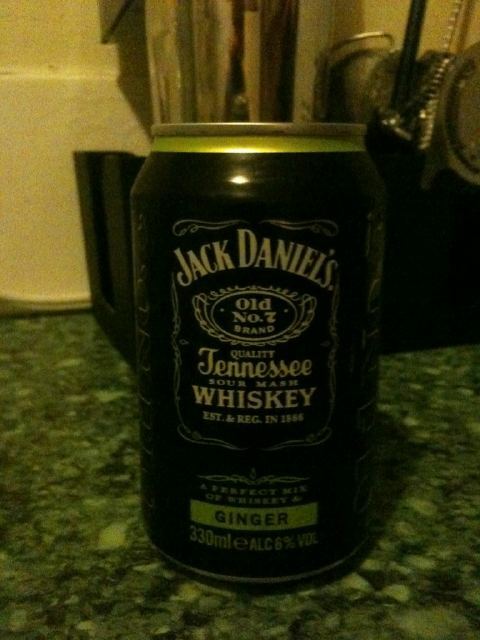 After looking over the can, it doesn’t mention if it’s ginger beer or ginger ale (not being a lover of ginger ale, I was hoping for the former) but then I thought that Jack Daniels could have used ‘actual’ ginger, and I was right. I’ve personally rarely come across a drink as simple as Jack Daniels and mixer to have the sole ingredient as ginger, yet could see it working rather well. Upon opening, there’s an immediate aroma of ginger, and hardly a scent of Jack Daniels. Give it a few seconds though and you do slowly get that unmistakable JD wafting through your nostrils. The taste is rather the same as the smell, with the whiskey taking a back-seat to the raw ginger, yet creating a pleasant slow mix of the two flavours in your mouth. It leaves a slight sweet taste in the back of your mouth as it makes its way through which resulted in me drinking this can quicker than the JD & Coke (the sweet tooth in me took over!). Again at 6%, you do expect to see more of the Jack Daniels coming through as you drink but it just doesn’t seem to happen. 1. It’s unique. When was the last time you had a whiskey with just ginger? And I can guarantee it would taste even better fresh. 2. On a summer’s day, a Jack Daniels & Ginger sounds like a hell of a drink to have, a chilled one at that. A Jack Daniels & Coke? You can have that any day of the week at any place that sells alcohol. JD & Ginger? Your high-end expensive bars would charge you 4x as much as the £2.12 you could get it for. I’m an old lady,I like to taste the ginger.I all but quit drinking because I don’t like the taste of it.But I do like a buzz.JD n ginger is the best.a controled measure just right.if I had to mix them myself they would get stronger ever time…that’s just how it is.a bottle is cheaper but goes faster…I’m really glad you did this right.I can control my intake and it always taste the same…thanks.